Top Oil have been meeting the fuel needs of our customers for over five decades. As a 100% Irish owned company with a 200 year trading history, you simply couldn’t fuel with anyone better! We own and manage our own 55,000 tonne import terminal in Dublin and sell over 1.3 billion litres of fuel throughout Ireland annually. We provide a true end-to-end service from ‘Port-to-Pump’ so you can be sure you are getting the best Quality Assured fuel products every time you refuel with us. We are immensely proud of our service station network. We operate 180 Top Oil service stations, which are strategically located throughout Ireland so that you are never too far away from a Top Oil Service Station when you are travelling. Plenty of our service stations are located near the motorway network of Ireland and we supply our Quality Assured fuels into the Motorway Service Areas on the M1 and M4. You can rest assured that when you are purchasing our fuel products at our locations, you are buying the best fuel products available in the Irish market. For your convenience, we have created an innovative and interactive map to help guide you to your nearest Top Oil Service Station. Upon arrival, you can look forward to being greeted by friendly local staff and you can avail of various services for your vehicle and for you. Our new Top Oil map lists the opening times and services available at each of our Top Oil Service Stations. We look forward to seeing you soon! Many of our Top Oil Service stations are now signed up to our Fuel Quality Assured Location scheme. To achieve this status, Top Oil service stations undergo a site audit on their operations and fuel Once they have passed stringent tests they are awarded their Fuel Quality Assured Location Certificate, and these Top Oil service stations can proudly promote they are part of this high profile scheme. We pride ourselves on our hunger for growth to ensure we reach as many customers as we possibly can. In 2015 alone, we rebranded 15 service stations across the country. 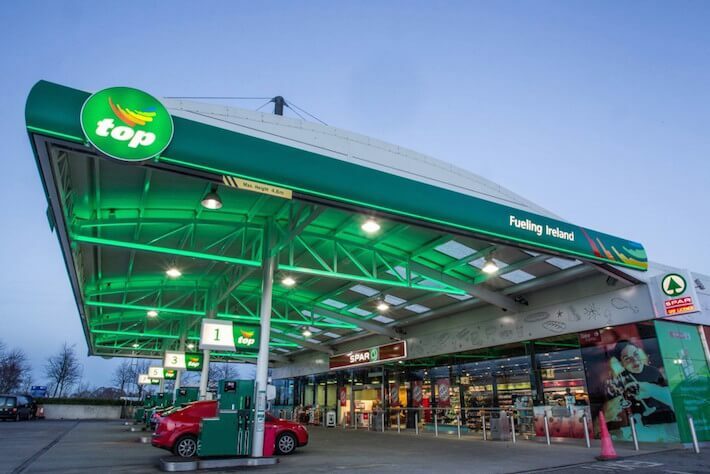 We recently signed up three service stations in Dublin, one in Galway and one in Limerick to our Top Oil Fueling Ireland brand and have won two national awards. We are highly regarded within the industry and whilst we are ambitious, our name remains synonymous with trust and that local touch.